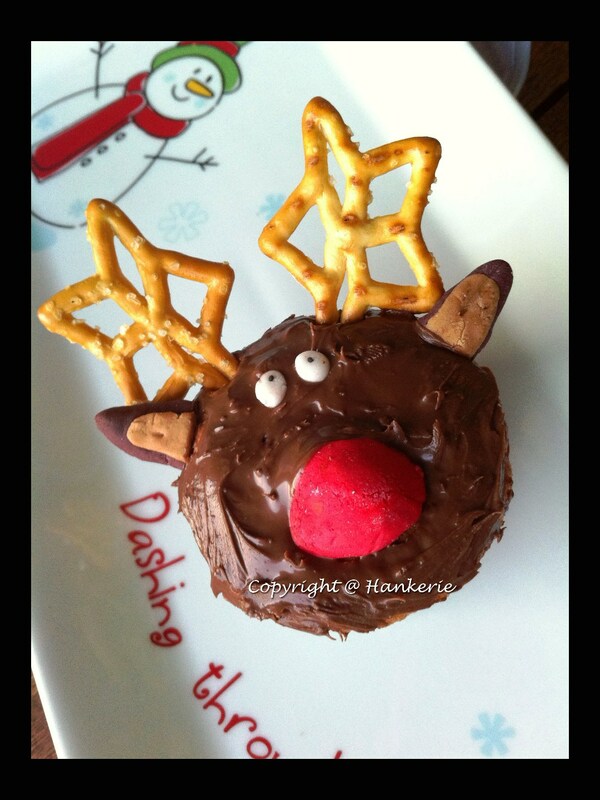 "Hankerie's Xmas Reindeer Nutella Cupcakes"
Have a jolly holly Christmas with Hankerie this month!! Thanks to SSB for giving me the chance to host this month Aspiring Bakers challenge. This month theme is similiar to last year Xmas theme, the only difference is the creativity of your Xmas bakes. Of course, we do hope more submission coming this year too. Get ready of your bakeware and let your own creativity flows for this coming festive. 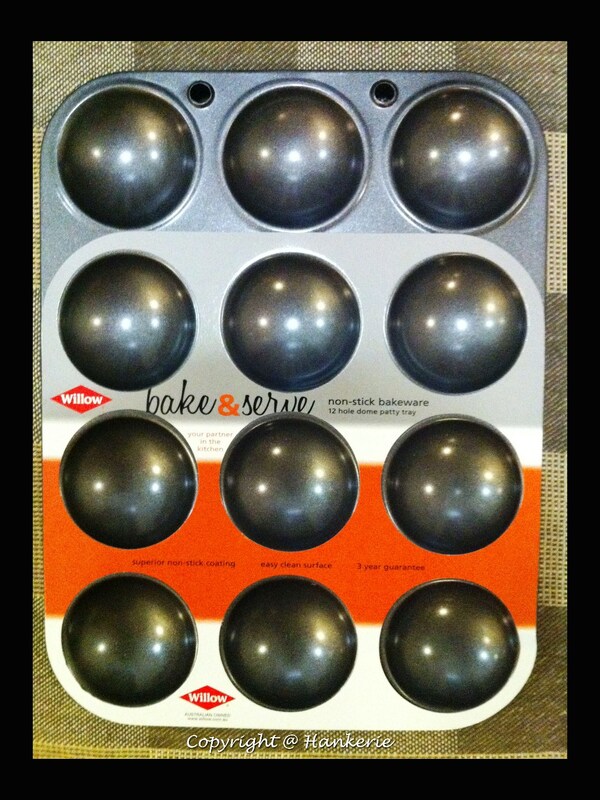 One exciting giveaway worth AUD39.90 (MYR130) for the winner to keep new bakeware into your collection. Definition of the Creative Christmas Bakes: We want more ideas coming in for the Xmas, no constraints of any bakes that you would like to submit (For e.g Xmas cookies, cakes, pies, or gingerbread house). We do emphasize the originality & creativity of your bakes. Can be any bakes of related to Xmas based on your own creativity, in the month of December 2011. Post it on your blog between 01 December 2011 and 31 December 2011. Please mention that you are submitting your post to Aspiring Bakers #14: Creative Christmas Bakes (December 2011) hosted by Hankerie and provide a link back to this post HERE. Please use "Aspiring Bakers #14" as your email subject. You may submit more than 1 entry. The roundup will be posted on 01 January 2012. As a token of appreciation, I'm giving away this exclusive Australia "Willow" brand - non-stick bakeware with 3-years guarantee. It is 12-hole dome patty tray for the most creative Xmas bakes winner worth. I will start to post all the entry photo in my "Hankerie" Facebook album and let people vote. The closing date for the votes is 7th January 2012. The winner (with most "likes") will be announced in my blog & Facebook on 8th January 2012 (to be fair for those late submissions). Take note the prize is sponsored by myself. If you are interested to find out what's on the previous Aspiring Bakers #13: Enjoy Cupcakes! (November 2011) hosted by Min of Min's Blog, check it out. @ Zoe: Hope to see your Xmas bake soon. Look forward to all the entries. Thanks for hosting! @ SSB: Looking forward too. Thanks. @ Wndy: Thank you as this is the gift that I would like to have too. Just treat as the baker's XMas gift. Hope to see your entry soon too. nice.. hope i have time to join this round's AB. creative xmas bake, that means we have to create our own recipe? or can we use the recipe from recipe books? @ Swee San: Hope to see your entry very soon ya. @ Pet 猫猫 : You can use any recipe in the book, just need to state it where do you get from. Creative means how do you want to present in the more creative way for Xmas. LOL.... that's a funny one! So cute!! That is very generous of you, hankerie! I hope to join in the AB event this month! @ Alice: Nice meeting you too. @ Tiffany: I presume you are referring to my reindeer cupcakes?? Thanks anyway. @ Passionate about baking: I love your name!!! Coz me2... Hope to see your entry soon. Or will dishes be ok too? @ Wendy & 佳佳: Any dishes/bakes which you will need to use oven to BAKE - 烘. Hope to see your submission soon. I hope that I will find time to participate! Thanks for sharing this event. @lesrecettesdupanier : Hope to see your entry soon. Hi Hankerie, got a question, does baked pasta consider as a christmas bake? Heehee, just trying my luck, thanks! @ Honey Bee Sweets: Yes, anything which you've baked with oven for Xmas. You may submit as many as you like. Looking forward to see your entries soon. The cupcakes look great. I wish I saw this sooner. I would have loved to join.